Looking for a small range of geyser that is compact affordable and fulfils your needs for instant hot water right on call? Then this range of Activa Kwa metal instant water heater is just for you. This 6 litre capacity geyser has been specifically designed keeping in mind the needs of individuals or a small family of 2-3 members. This small capacity compact geyser is easy to install and can be mounted vertically on the bathroom wall while taking the least of space. With a powerful wattage of 3000 W this small yet heavy duty geyser will give you instant hot water thanks to its magnesium anode that works well with hard water too. For heat retention this geyser has been given an extra thick capsule type inner tank with automatic thermostat and power saving insultation making it an efficient product. You can easily buy this geyser range for the best price on and get assured quality. 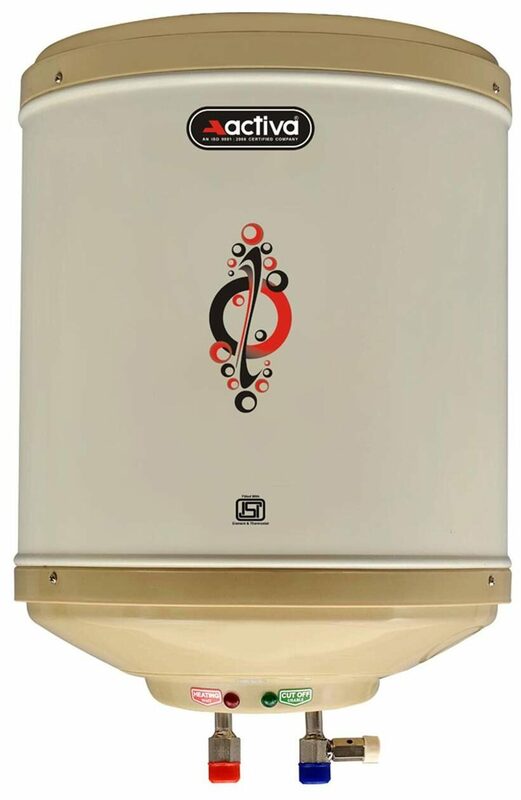 # Capacity # Activa Kwa metal instant water heater comes with a limited capacity of 6 litres and is made for usage of 2 to 3 individuals for an uninterrupted water supply. # Compact Design # This small capacity geyser has been given a conventional and compact design making it easy to fit in small bathrooms also. Make sure this vertical geyser is mounted safely and sturdily on the wall. # Incoloy Heating Element # For safe and sound heating process this efficient geyser has been fitted with ISI marked heating element that instantly heats up the water and is absolutely safe. The element is extra heavy while ensures high level of durability of the product. # The long-lasting geyser has been given a sturdy stain less steel tank inner tank. The tank has a processed powder coated body. To safeguard the geyser from rust or corrosion it has been given a plastic top and bottom. # Automatic Thermostat # For keep away from issues like overheating dry heating and over pressure the Activa Kwa metal instant water heater has been fitted with this conventional feature of auto thermostat that cuts off power after the water is heated to the maximum temperature. # This 3000 W geyser is power efficient and comes with magnesium anode for long life in hard water. # Warranty # For your preference for quality assured products this geyser with warranty is the perfect deal. On purchase of this product you get a 2 year manufacturer warranty and 1 year warranty on electrical components. # The images represent actual product though color of the image and product may slightly differ.